August 2014 – Comedy or Tragedy? Today is the first day of the fall semester, and so the wild rumpus begins again. I’ve only just returned from our two week trip to Norway and am crazy jet-lagged. Setting the time difference aside, it’s pretty disorienting to go from wearing winter clothes in August while hiking through a spectacular fantasy landscape in 22 hours of daylight to sweating on the concrete streets of Brooklyn. Suffice it to say, I’m still adjusting to being back. The trip was, in a word, breathtaking. I honestly felt as though I were exploring the wild and untamed wilderness of Lord of the Rings. 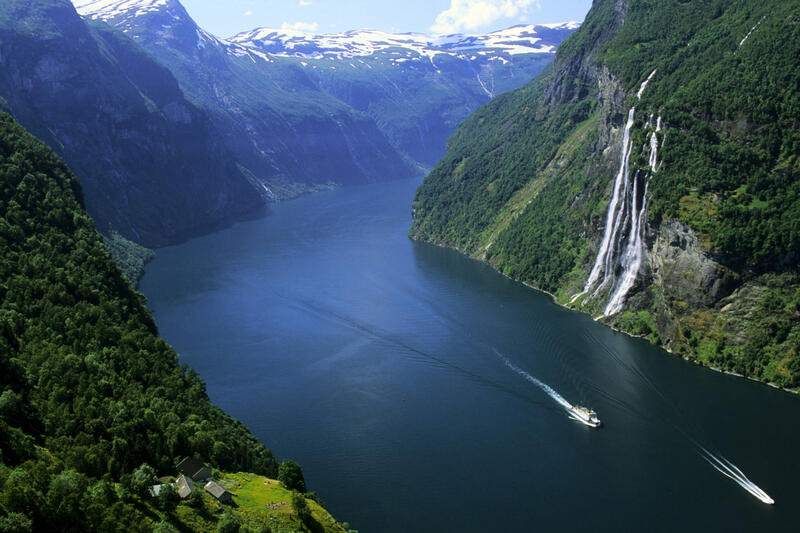 The fjords were so serene, so still, and so immense that you felt almost invisible. A tiny speck of a thing passing nearly unnoticed through a landscape untouched by modern blight. We spent about five days all told exploring places (almost entirely by boat and canoe) with magical names like Songefjord, Esefjord, Faerlandsfjord, Naeroyfjord, and Hardangerfjord. And I really thought it could not get any better. Then we rented a car and drove the hairpins turns up into the Jotenheim mountains. There were far fewer tourists here — I think the peaks outnumbered the people. And those peaks were insane. Jagged and soaring with hooks and glaciers (so many glaciers!) and spires. I had thought the fjords immense but the mountains truly dwarfed all. We passed through eerie moonscapes covered only with moss and lichen in some places, and richly forested slopes adorned with roaring waterfalls in others. One day we drove up to the the highest car accessible point (Jurvasshytta). It was snowing at the top and all the mountains spread out below us. I felt as if our car might simply slip off the narrow little road and tumble down and down forever. It was terrifying. Also, exhilarating. We hiked until our legs gave out and stuffed ourselves full of wine and salmon and venison and potatoes in the evenings, curling up in front of a crackling fire while the Norwegian night grew colder and colder. It was hard, honestly, to think about leaving all the silence and beauty and returning home. But, home we had to go. So now I’m back and thrust into the chaotic world of New York and work and the subway and students and noise and people, people, people. This is all wonderful in its own lively way, but (honestly) I miss Norway.